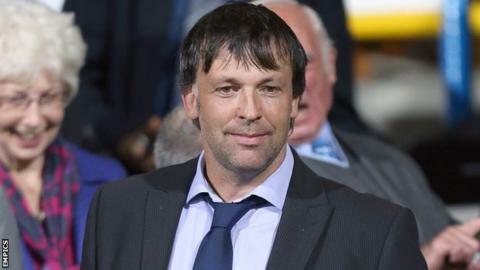 Blackpool chairman Karl Oyston says the Championship club will soon have "as many players as everyone else". The club had a squad of eight before five additions this week but are still without a keeper ahead of their first match at Nottingham Forest on 9 August. Disgruntled fans are planning to boycott Saturday's Burnley friendly. But Oyston, criticised by president Valeri Belokon for not investing more money in the team, added: "It will not stop me from doing the best job I can." "Signing players is not as simple as people make out. They don't just turn up in the morning and they're signed by tea. We have had a failed medical and an agent from Timbuktu asking for £200,000 to be deposited in a Swiss bank account - seriously"
Belokon, who owns a 20% stake in the club, wrote an open letter urging Oyston to "put football first" while questioning financial management at the club. Oyston responded in a letter posted to the club website earlier this week, in which he said Blackpool were "unique" in that they were a "debt-free, cash-rich club, unlike many of our competitors that will suffer the ravages of a transfer embargo as early as January 2015, when they fall foul of the Financial Fair Play regulations". A separate dispute between Oyston and new manager Jose Riga over transfers led to the cancellation of a pre-season tour of Spain. But Oyston asked for understanding. "Signing players is not as simple as people make out," he said. "They don't just turn up in the morning and they're signed by tea. We have had a failed medical and an agent from Timbuktu asking for £200,000 to be deposited in a Swiss bank account - seriously. "By the time the window closes we will have as many players as everyone else. The Premier League sides will offload their flotsam and jetsam and there will be a few youngsters." Oyston told the BBC he understood some of the fans' frustrations. "I know some supporters want to see vast sums spent and I am of that mindset," he said. "But I don't operate the club like that. When I arrived we were floundering in League Two with a toilet of a ground." Oyston refused to predict where Blackpool will finish in the Championship. He added that he did not know when Riga, who has held one press conference since taking over in June, would be speaking to the media again. "He's a sensitive human being," he said. "He will speak when he is ready to speak. It is not something we have discussed. He was late into the job and I would prefer he focuses on the challenge ahead." The club have been the subject of intense media coverage this summer - but Oyston is unconcerned. "It's been unfortunate but it won't alter the way I approach things," he said. "I could not hope to find a more interesting job."